No matter how hard I try, I just cannot like this film in its entirety. 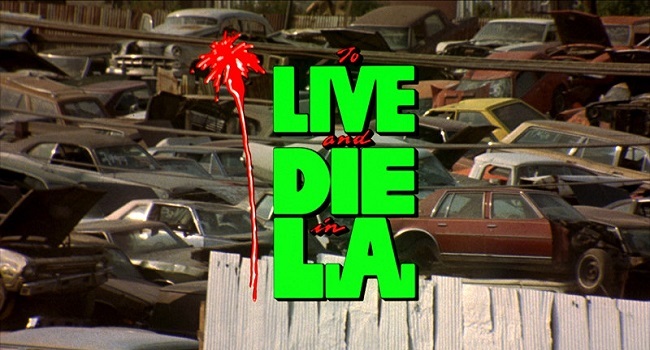 ‘To Live and Die in L.A.’ is ultimately something of a snorefest; watch this with even a grain of lethargy and you’ll be lost. And that’s a shame, because there is much artistic merit to be found in the film. The killer Wang Chung soundtrack compliments stylish sequences throughout, and is especially effective when capturing the Los Angeles landscape. The opening montage is very striking both visually and aurally; the sequence showing Master’s counterfeiting procedure is also a pleasure to watch. Sadly though, the first twenty minutes and the closing credits of the film are the most interesting and engaging. Surprisingly even its stylistic flair becomes tired, Wang Chung is overused and placed in sequences that just don’t require it. ‘To Live and Die in L.A.’ could’ve been far tauter; it rouses you from your catatonic state only a few times with its surprising violence and of course that famous lengthy car chase. The premise is simply Richard Chance’s (William L. Peterson) relentless pursuit of a murderous counterfeiter named Eric Masters (Willem Dafoe) who has killed Chance’s partner and ‘best friend for seven years’. Chance, whose safety is hindered in the haze of his own hubris, is prepared to do whatever it takes to put an end to masters, even if it means breaking the law he enforces. Peterson’s anti-hero is certainly clichéd; when presented with his new partner John Vukovich (John Pankow), he delivers the common ‘You know I work alone’ trope. In its entirety, ‘To Live and Die in L.A.’ is a superficial, viewer-unfriendly production that just doesn’t engage its audience. The characters are unsubstantial, the plot is tediously bloated and hard to follow and its aesthetic redeeming features soon become tired over its 1hr 56 minutes. Not even its director William Friedkin could save it; it wouldn’t be until his collaboration with writer Tracy Letts 20 years later that he would return to the form of ‘The Exorcist’ and ‘The French Connection’. Some may be offended by it, but I think Killer Joe is the best film of 2012. Killer Joe’s premise is simple but invigoratingly delivered. Chris Smith (Emile Hirsh) has got himself in trouble with the underworld, if he doesn’t produce some cash, he’s a dead man. He reasons with his father Ansel (Thomas Haden Church) that everyone would be happier if his obnoxious mother Adele was killed, particularly as she has a $50,000 life insurance policy. Considering Adele is his wretched ex-wife, he agrees, as does his girlfriend Sharla (Gina Gershon) and teenage daughter Dottie (Juno Temple). Although Chris doesn’t have the money up front, Killer Joe, a Dallas police officer who moonlights as a contract killer, accepts the job on the condition that Dottie serves as sexual collateral. ‘Killer Joe’ is a fantastic thriller with a warped tension that you don’t encounter that often. This film confirms that Matthew McConaughey is on a rapid upward trajectory, he gives an intense performance that’s utterly steeped in menace. Though ‘Killer’ Joe Cooper remains largely restrained and ambiguous throughout the film, each syllable of his southern drawl is loaded with a palpable danger. His performance is captivating; it creates a pervasive, looming sense of dread and depravity that suggests something very bad is going to happen at any moment. The praise doesn’t stop with McConaughey, the whole cast delivers to the best of their ability, it really is an actors’ film. If I hadn’t researched her, I would have assumed on the credibility of her southern accent that the British Juno Temple was a Texas native. She shows good dramatic range as Dottie, the slightly strange, child-like girl at the centre of the film. William Friedkin has outdone himself with his second collaboration with writer Tracy Letts; he directs the taut, punchy material perfectly. What’s most refreshing is that 77-year-old Friedkin was bold enough to release it uncut with the dreaded NC-17 certificate; he wasn’t going to allow himself to sell out. Seeing as the film’s source material is a stage play, it isn’t a film of many sets; it seldom leaves the confines of the Smith family’s trashy trailer. Much like their first collaboration ‘Bug’, ‘Killer Joe’ impressively manages to deliver biting tension and a maelstrom of chaos in a cramped, domestic setting. I can honestly compliment every area of this film. Tyler Bates’ score is brilliantly suspenseful, especially when it introduces Killer Joe, it further adds to his aura of danger. The film is also beautifully shot – it’s stunning in high definition. Despite the menace and darkness of it all, the film is laced with deadpan humour, especially in the film’s final quarter, the demented absurdity of which leaving you wondering what the hell just happened!